For our 2015 data on sales taxes, click here. 45 states collect statewide sales taxes. 38 states collect local sales taxes. The five states with the highest average combined state-local sales tax rates are Tennessee (9.45 percent), Arkansas (9.19 percent), Louisiana (8.89 percent), Washington (8.88 percent), and Oklahoma (8.72 percent). 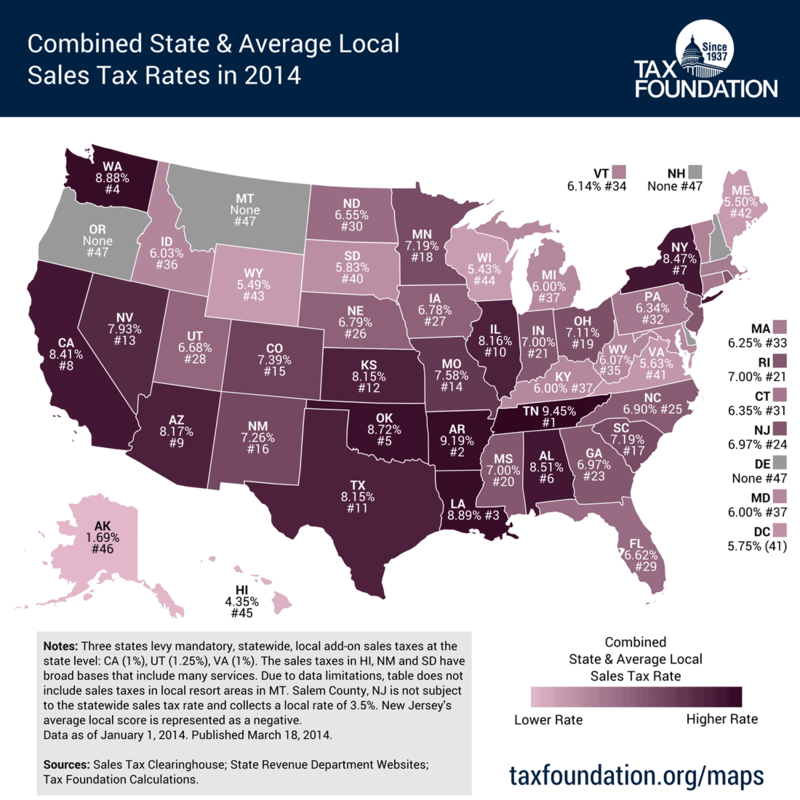 Virginia, Arkansas, Ohio, and Maine have recently raised sales tax rates. Arizona, Kansas, and the District of Columbia have recently cut sales tax rates. Sales taxes rates differ by states, but sales tax bases also impact how much revenue is collected from a tax and how the tax effects the economy. Differences in sales tax rates cause consumers to shop across borders or buy products online. Retail sales taxes are one of the more transparent ways to collect tax revenue. While graduated income tax rates and brackets are complex and confusing to many taxpayers, the sales tax is easier to understand: people can reach into their pocket and see the rate printed on a receipt. Less known, however, are the local sales taxes collected in 38 states. These rates can be substantial, so a state with a moderate statewide sales tax rate could actually have a very high combined state-local rate compared to other states. This report provides a population-weighted average of local sales taxes in an attempt to give a sense of the statutory local rate for each state. See Table 1 at the end of this Fiscal Fact for the full state-by-state listing of state and local sales tax rates. Five states do not have a statewide sales tax: Alaska, Delaware, Montana, New Hampshire, and Oregon. Of these, Alaska and Montana allow localities to charge local sales taxes. The five states with the highest average combined rates are Tennessee (9.45 percent), Arkansas (9.19 percent), Louisiana (8.89 percent), Washington (8.88 percent), and Oklahoma (8.72 percent). The five states with the lowest average combined rates are Alaska (1.69 percent), Hawaii (4.35 percent), Wisconsin (5.43 percent), Wyoming (5.49 percent), and Maine (5.50 percent). California has the highest state-level rate at 7.5 percent. Five states tie for the second-highest statewide rate with 7 percent each: Indiana, Mississippi, New Jersey, Rhode Island, and Tennessee. The lowest non-zero statewide sales tax is in Colorado, with a rate of 2.9 percent. Seven states follow with 4 percent: Alabama, Georgia, Hawaii, Louisiana, New York, South Dakota, and Wyoming. As a result of new transportation legislation, Virginia’s statewide sales tax rate increased on July 1, 2013 from 5 percent to 5.3 percent. Localities in Northern Virginia and Hampton Roads charge a 6 percent combined rate. Also effective July 1, 2013, Arkansas raised its state sales tax rate from 6 percent to 6.5 percent. On September 1, 2013, Ohio increased its sales tax from 5.5 percent to 5.75 percent as a component of tax reform efforts there this legislative session. Effective October 1, 2013, Maine increased its statewide sales tax from 5 percent to 5.5 percent as a result of a legislative override of Governor Paul LePage’s veto. This increase is scheduled to sunset in June 2015. Arizona, by contrast, cut its rate from 6.5 percent to 5.5 percent as a temporary sales tax increase expired on July 1, 2013, and Kansas moderately cut its statewide sales tax rate from 6.3 percent to 6.15 percent on the same date. The District of Columbia lowered its sales tax from 6 percent to 5.75 percent on October 1, 2013. The five states with the highest average local sales tax rates are Louisiana (4.89 percent), Alabama (4.51 percent), Colorado (4.49 percent), New York (4.47 percent), and Oklahoma (4.22 percent). Mississippi has the lowest non-zero average local rate of 0.004 percent, attributable to the state’s only local sales tax: a 0.25 percent sales tax in Tupelo, the birthplace of Elvis Presley. Salem County, New Jersey is exempt from collecting the 7 percent statewide sales tax and instead collects a 3.5 percent local tax. We represent this anomaly as a negative 0.03 percent statewide average local rate (adjusting for population as described in the methodology section, below), and the combined rate reflects this subtraction. Despite the slightly favorable impact on the overall rate, this lower rate represents an implicit acknowledgement by New Jersey officials that their 7 percent statewide rate is uncompetitive with neighboring Delaware, which has no sales tax. Avoidance of sales tax is most likely to occur in areas where there is a significant difference between two jurisdictions’ sales tax rates. Research indicates that consumers can and do leave high-tax areas to make major purchases in low-tax areas, such as from cities to suburbs. For example, strong evidence exists that Chicago-area consumers make major purchases in surrounding suburbs or online to avoid Chicago’s 9.25 percent sales tax rate. At the statewide level, businesses sometimes locate just outside the borders of high sales tax areas to avoid being subjected to their rates. A stark example of this occurs in the northeast part of the country, where even though I-91 runs up the Vermont side of the Connecticut River, many more retail establishments choose to locate on the New Hampshire side of the river to avoid sales taxes. One study shows that per capita sales in border counties in sales tax-free New Hampshire have tripled since the late 1950s, while per capita sales in border counties in Vermont have remained stagnant. The state of Delaware actually uses its state border welcome sign to remind motorists that Delaware is the “Home of Tax-Free Shopping.” State and local governments should be cautious about raising rates too high relative to their neighbors because doing so will amount to less revenue than expected, or in extreme cases, revenue losses despite the higher tax rate. This report ranks states and cities based on tax rates and does not account for differences in tax bases (e.g., the structure of sales taxes, defining what is taxable and non-taxable). States can vary greatly in this regard. For instance, most states exempt groceries from the sales tax, others tax groceries at a limited rate, and still others tax groceries at the same rate as all other products. Some states exempt clothing or tax it at a reduced rate. The taxation of services and business-to-business transactions also vary widely by state. Experts generally agree that Hawaii has the broadest sales tax in the United States, taxing many products multiple times and, by one estimate, ultimately taxing 99.21 percent of the state’s personal income. This base is far wider than the national median, where the sales tax base applies to 34.46 percent of personal income. Sales Tax Clearinghouse publishes quarterly sales tax data at the state, county, and city level by ZIP code. We weight these numbers according to Census 2010 population figures in an attempt to give a sense of the prevalence of sales tax rates in a particular state. It is worth noting that population numbers are only published at the ZIP code level every ten years by the Census Bureau, so the methodology in this version is slightly different than editions of this calculation published before July 1, 2011. It should also be noted that while the Census Bureau reports population data using a five-digit identifier that looks much like a ZIP code; this is actually what is called a ZIP Code Tabulation Area (ZCTA), which attempts to create a geographical area associated with a given ZIP code. This is done because a surprisingly large number of ZIP codes do not actually have any residents. For example, the National Press Building in Washington, DC, where the Tax Foundation is located, has its own ZIP code solely for postal reasons. For our purposes, ZIP codes that do not have a corresponding ZCTA population figure are omitted from calculations. These omissions result in some amount of inexactitude but on the whole should not have a palpable effect on resultant averages, because proximate ZIP code areas which do have a ZCTA population number assigned to them capture the tax rate of whatever jurisdiction the area is located in. Of course, sales taxes are just one part of an overall tax structure and should be considered in context. For example, Washington State has high sales taxes but no income tax; Oregon has no sales tax but high income taxes. While many factors influence business location and investment decisions, sales taxes are something within policymakers’ control that can have immediate impacts. (b) Three states levy mandatory, statewide, local add-on sales taxes at the state level: California (1%), Utah (1.25%), Virginia (1%), we include these in their state sales tax. (e) Salem County is not subject to the statewide sales tax rate and collects a local rate of 3.5%. New Jersey’s average local score is represented as a negative. This number includes a mandatory 1 percent add-on tax which is collected by the state but distributed to local governments. Because of this, some sources will describe California’s sales tax as 6.5 percent. A similar situation exists in Utah and Virginia. Joseph Henchman, Virginia Legislators Approve Increases in Sales Tax, Car Tax, Regional Taxes, Tax Foundation Tax Policy Blog, Feb. 25, 2013, https://taxfoundation.org/blog/virginia-legislators-approve-increases-sales-tax-car-tax-regional-taxes. Joseph Henchman, State and Local Ballot Initiative Results, Tax Foundation Tax Policy Blog, Nov. 6, 2012, https://taxfoundation.org/blog/state-and-local-ballot-initiative-results. Elizabeth Malm & Zachary Bartsch, Maine’s Not-So-Beautiful Sunset, Tax Foundation Tax Policy Blog, June 28, 2013, https://taxfoundation.org/blog/maine%E2%80%99s-not-so-beautiful-sunset. Angie Holdsworth, Temporary 1 cent Arizona sales tax ends Friday, ABC 15, May 31, 2013, http://www.abc15.com/dpp/news/state/temporary-1-cent-arizona-sales-tax-ends-friday. Scott Drenkard & Joseph Henchman, D.C. Now Better than Virginia and Maryland on Sales Tax Rates, Tax Foundation Tax Policy Blog, Oct. 2, 2013, https://taxfoundation.org/blog/dc-now-better-virginia-and-maryland-sales-tax-rates. Tupelo Convention & Visitors Bureau, http://tupelo.net/. Mehmet Serkan Tosun & Mark Skidmore, Cross-Border Shopping and the Sales Tax: A Reexamination of Food Purchases in West Virginia (Working Paper, 2005), http://www.rri.wvu.edu/pdffiles/Tosunwp2005-7.pdf. See also Randolph T. Beard, Paula A. Gant, & Richard P. Saba, Border-Crossing Sales, Tax Avoidance, and State Tax Policies: An Application to Alcohol, Southern Economic Journal, 64(1), 293-306 (1997). Susan Chandler, The Sales Tax Sidestep, Chicago Tribune, July 20, 2008, http://articles.chicagotribune.com/2008-07-20/business/0807190001_1_sales-tax-tax-avoidance-tax-landscape. Art Woolf, The Unintended Consequences of Public Policy Choices: The Connecticut River Valley Economy as a Case Study, Northern Economic Consulting (Nov. 2010), http://vtdigger.org/vtdNewsMachine/wp-content/uploads/2011/02/20101101_woolfArtUnintended.pdf. Len Lazarick, Raise taxes, and they’ll move, constituents tell one delegate, Marylandreporter.com, Aug. 3, 2011, http://marylandreporter.com/2011/08/03/raise-taxes-and-theyll-move-constituents-tell-one-delegate/. For a list, see Tax Foundation, 2014 State Business Tax Climate Index, Tax Foundation Background Paper No. 68 (Oct. 9, 2013), https://taxfoundation.org/article/2014-state-business-tax-climate-index. 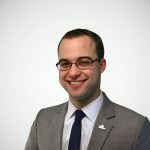 Joseph Henchman, State Sales Taxes on Clothing, Tax Foundation Tax Policy Blog (Jan. 24, 2012), https://taxfoundation.org/legacy/show/27915.html. For a representative list, see Tax Foundation, 2014 State Business Tax Climate Index, Tax Foundation Background Paper No. 68 (Oct. 9, 2013), https://taxfoundation.org/article/2014-state-business-tax-climate-index. John Mikesell, The Disappearing Retail Sales Tax, State Tax Notes, Mar. 5, 2012, 777-791.